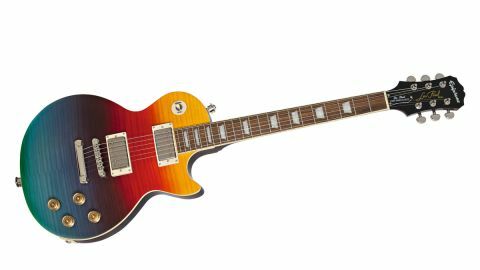 One of the smartest Les Pauls Epiphone has produced, offering plenty of Gibson flavour for a considerably lower price tag - and other finishes are available! Those Gibson pickups sound fantastic. Neck profile occupies a playable middle ground. The finish, obviously – but less ostentatious options are available. There’s plenty that is audacious about the Epiphone Les Paul Tribute ‘Prizm’ Plus Outfit electric guitar. And we’re not just talking about a multicolour finish that would be more commonly sighted flying above the treeline in the Amazon, nor the SEO-friendly, convoluted word salad it goes by (we’ll call it the Tribute Plus for brevity). No, it’s in the fashion that Epiphone has equipped this Chinese-built electric with pro-quality parts to create a premium guitar that might just make you think twice before plumping for one of Gibson’s more affordable US models. Epiphone has form in such manoeuvres. Its premium Les Pauls have always been super-playable and affordable, with a tone invoking its parent brand, Gibson. The Tribute Plus is no different. Take the pickups. Here, we have a Gibson USA ’57 Classic humbucker in the neck, with the ever-so-slightly hotter ’57 Classic Plus in the bridge. As the name suggests, these are vintage voiced replicas of the PAF-style humbuckers that were first designed by Seth Lover in the 1950s. You would expect to see them in a Gibson USA model, perhaps an SG ’61 Reissue, and yet here they are, seated in a generous slab of mahogany capped with flame maple. This would be enough to be getting on with but Epiphone takes it further, augmenting the traditional Les Paul configuration of two volume/two tone controls with the latter offering a push-pull choice between wiring the pickups in series and parallel. The default series wiring offers what we might expect; sure, there’s treble, plenty of presence and bite, but that’s balanced and rounded out by the Tribute Plus’s ample frame, which keeps the tone warm and thick. In parallel, this tone opens up. There’s more brightness, a little more elasticity and pop, some more juice in the upper registers, giving it a slightly different voice while retaining its humbucking properties. This feels much more of a piece with the Tribute Plus’s tone than having, say, a splitter to render the humbucker as a single coil; it adds options without wholly changing the character of the guitar. There’s no mistaking the Les Paul DNA in the Tribute Plus’s voice. With the pickups in default series wiring, there’s still so much play that can be had by adjusting the tone and volume controls. Without going full-on ice pick, the bridge pickup’s treble is sharp and definitive, and really comes into its own with your amp on the point of break-up, serving up heaps of snappy blues-rock mojo. Acolytes of Page, Slash, Moore et al will not be disappointed. Perhaps the biggest joy in playing the Tribute Plus is in finding all these new sweet spots for your tone, safe in the knowledge that you’ve got some genuine Les Paul tone on tap. But those who favour a slimmer neck might argue that its playability seals the deal. The Tribute Plus boasts a '60s-style slim D profile that is eminently playable, but not so svelte that the instrument feels imbalanced. Epiphone doesn’t explicitly say that the neck construction uses the favourable long neck tenon as found on the super-premium Gibson Historic series and suchlike, but in describing it as a “deep-set neck joint,” it can’t be too dissimilar, and only adds to the impression that the Tribute Plus is one seriously solid piece of craft. Why does this matter? That solid construction is where the Les Paul’s famous sustain comes from, and you will find the Tribute Plus to be a willing ally for those moments when you bend a note and hold it. The Tribute Plus is definitely a guitar built for such moments. We said it was audacious at the top of the review - and that finish, redolent of or inspired by Al DiMeola’s signature PRS is certainly that. More suitable adjectives might include genuine, authentic, fun, surprising, and serious. It might lack the Gibson Custom Shop build, but for an affordable, mass-produced instrument the Tribute Plus is unimpeachable, with a mighty serious spec that is incredible for the price. Would we recommend spending an extra £500 on a USA-built Gibson? Who can say? That’s a tough one. That it’s so tough proves Epiphone are right on the money here.